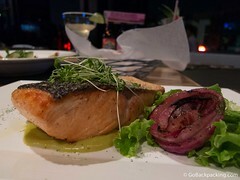 The following list of the approximately 50 best restaurants in Medellin is based on my personal favorites, and those of contributors. You can also access detailed reviews on the top 12 restaurants from Latin Hosts based on feedback from their Medellín visitors and hosts. They also provide a free reservation service, which is useful for popular restaurants such as El Cielo or Carmen. Price symbols are based on the cost of an average entree. $ = 0 to 15,000 pesos. Self-service, fast food, or a cafe. $$ = 16,000 to 24,000 pesos. Average sit down restaurant. $$$ = 25,000 to 40,000 pesos. Higher quality food, service, and atmosphere. $$$$ = 41,000+ pesos. The most expensive, upscale restaurants in the city. American Poblado and Laureles Chef Burger Bar $$ With most burgers priced under $10, including the side of fries or small salad, it's a great value. American Poblado Hard Rock Cafe $$$ In the Hard Rock tradition, Medellin's spacious restaurant is filled with music memorabilia and a stage for live performances. The menu is standard issue, featuring a variety of American comfort foods, from burgers to ribs. A large outdoor patio overlooks Avenida Poblado. American Parque Lleras Hooters $$ Beer, wings, and girls in skimpy outfits. The Medellin outpost of this famous chain offers everything you've come to expect. Go here when you're craving classic American bar food like buffalo wings, burgers, and quesadillas. American Barbecue Poblado Humo BBQ & Bar $$$ Located on Via Provenza, Humo is the second restaurant in Medellin by chef Carmen Angel. Humo serves classic American barbecue, including fall-off-the-bone ribs, and side dishes like cornbread, mac 'n cheese and grits. Brazilian Poblado Amarelo Rodizio $$$ Amarelo Rodizio is a Brazilian-owned restaurant serving all forms of meat, including beef, chorizo, chicken, fish, blood sausage, and various kinds of pork. Sides included Brazilian-style black beans, yellow rice, yucca, sweet banana, tomato ceviche and salad. 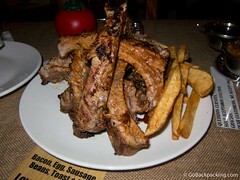 British Poblado MU Ribs $$$ British-owned MU serves "fukin good ribs" large enough to feed a family of dinosaurs. And that's all they serve, with a side of rustic fries. Only open on the weekends (Thurs, Fri, Sat) from 8 PM - Midnight. Café Parque Lleras Tinto Tintero $ Tinto Tintero is a longstanding, expat-owned café near Parque Llears known for its weekly language exchanges, movie nights, and coffee drinks. Alcoholic drinks are available too. 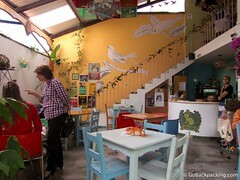 Café Laureles Café Vallejo $ Café Vallejo is a small independent coffee shop and book store located in Laureles. It's only open in the evenings, and has a limited food menu. Café Parque Lleras Pergamino $ Pergamino was opened by Pedro Echaverria, a 20-something Colombian with an American university education, and a wealth of experience in the coffee industry as the son of a coffee producer. It became an instant hit with tourists and expats looking for an alternative to Juan Valdez. 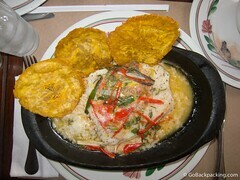 Colombian Rionegro Queareparaenamorarte $$$ La Queareparaenamorarte serves high quality Colombian food. Located in Rionegro, near Medellin, it was featured on Anthony Bourdain's No Reservations. Colombian Poblado Ajiacos y Mondongos * $$ Located across the street from Parque Poblado, this restaurant focus on a handful of classic dishes, and does them well. 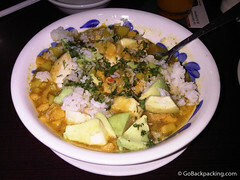 Ajiaco soup (Bogota), mondongo soup (Antioquia), and cazuela de frijoles are all on offer. Gets busy during the lunch rush. 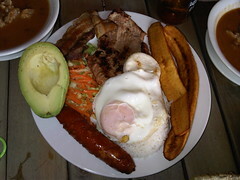 Colombian Poblado and Centro Hato Viejo $$ Established in 1982, Hato Viejo's three locations serve generous portions of traditional Antioquian cuisine, including bandeja paisa. Waiters dress the part, and the service is a step above your typical Colombian restaurant. Colombian Envigado Brasarepa * $$ Located on a street corner in Envigado, around the corner from a school, Brasarepa serves tasty versions of Colombia's typical fare. In 2008, Brasarepa was featured in a segment for Anthony Bourdain's "No Reservations" TV show. 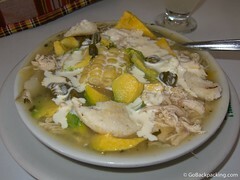 Colombian Poblado Mondongo's $$ Mondongo is a tripe soup from Antioquia. 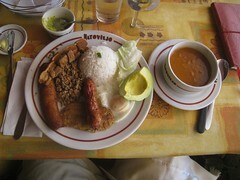 Chopped cow stomach is served in a broth with a variety of sides you throw into the soup, including avocado, bananas, rice, arepas, cilantro, and hot sauce. 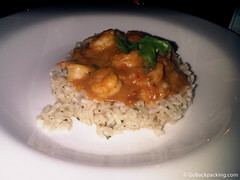 Creole Poblado Bonuar * $$ Bonuar is a bit hidden, along the side of the Modern Art Museum in Ciudad del Rio, but word has gotten out and it now draws diners from around the city for its flavorful burgers, and New Orleans and Brazil-inspired dishes. Thursday evenings feature a live blues band. Desserts Poblado Me Late Chocolate * $$ Inspired by Max Brenner, Australia's chain of chocolate cafes, Me Late's drinks and deserts will satisfy every chocolate lover who walks through its doors. 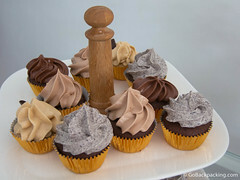 A variety of handmade chocolate truffles are also available. Desserts Envigado Biskiut - Taller Repostero $ Gourmet cupcakes, cookies, macaroons, and other sweets fill this little dessert shop run by a brother-sister duo. 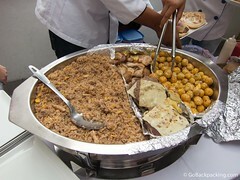 They also do catering for birthdays, weddings, and special events. French Laureles Paris Paris $$ Paris Paris is a new French-owned restaurant and café in Laureles. The concept is simple, authentic French food at prices everyone can afford. German Poblado El Alemán Pues $$ German-owned restaurant located two blocks north of Parque Poblado. They serve traditional German food, including 10+ varieties of sausage and 20+ varieties of beer. 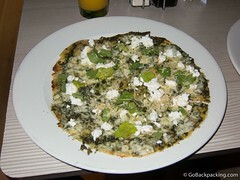 Greek Parque Lleras Cafe Mykonos $$ Get your Greek food fix at this new arrival in Parque Lleras. 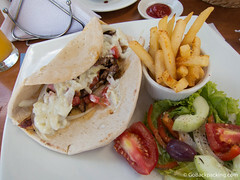 Cafe Mykonos features authentic dishes like mousaka and giros, as well as a variety of seafood options. Indian Poblado Naan $$ Indian food fans will find relief from arepas at Naan, a Colombian-owned restaurant in the Provenza neighborhood of Poblado, a short walk from Parque Llleras. 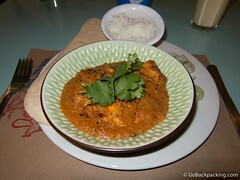 Dishes include yellow curry with chicken and red curry with shrimp in coconut milk. 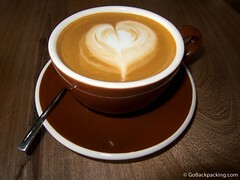 And don't forget the lassis and chai tea. International Poblado Café Le Gris $$$ Located at the entrance to Oviedo Mall, Café Le Gris offers a surprisingly upscale dining experience, with an extensive menu featuring everything from burgers to filet mignon, and a host of pastas and seafood dishes. The restaurant has been serving hungry diners for over 25 years. International Poblado D’ André Gourmet $$ Small Colombian-owned restaurant offering incredible value for your money, whether you're eating breakfast, lunch or dinner. International Poblado Herbario $$$$ Restaurant Herbario is owned by two long-time friends by the name of Carlos, who are also the owners of the popular Bonuar restaurant. International Poblado Brulée $$$$ Brulée is a restaurant that caught my attention on Instagram, where Argentinian Executive Chef Diego Aveiro regularly posts his kitchen’s creations. International Poblado Sinko Bar $$$ Sinko Bar occupies a prime spot on the 3rd floor of Rio Sur mall. An outdoor terrace overlooking Avenida Poblado offers the perfect setting for happy hour drinks and conversation, while the restaurant's menu is extensive. Sinko feels like it could've been plucked out of New York or Washington, DC. International Jardin Botanico In Situ * $$$ Nestled within the city's botanical gardens, In Situ features a modern take on traditional Colombian dishes. 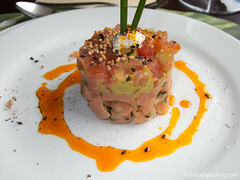 Try the salmon tartare or beef tongue ceviche to start, and follow it up with pesto-chicken stuffed with wild berries. 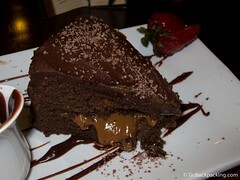 Don't skimp on dessert, they feature some of the city's best. International Poblado Carmen * $$$$ Regarded by many as the #1 restaurant in Medellin, Carmen is named after the California chef who opened the restaurant along with her Colombian father. Expect world class food and excellent service. Perfect for special occasions. 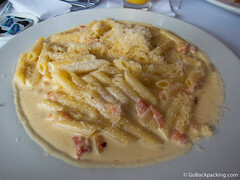 Italian Laureles Il Massimo $$$ Named after its Italian owner, Massimo, this Laureles restaurant offers authentic Italian dishes. Skip the pizza, as it's not as good as the rest of the menu options. Italian Poblado Il Castello $$$ Il Castello is one of the city's better Italian restaurants. Located on Calle 10A, a short walk from Parque Lleras. 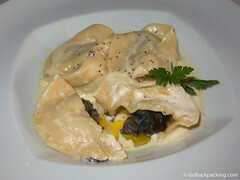 Mediterranean Poblado La Provincia * $$$$ One of Medellin's top restaurants, La Provincia offers a sophisticated menu, with plenty of seafood, and a few surprises, like escargot-stuffed ravioli. Beyond the food, diners will enjoy the upscale environment, and top-notch service. Mexican Envigado Tepito Tacos y Tequila $$ Mexican restaurant decorated from floor to ceiling in Lucha Libre masks and other Mexican kitsch. 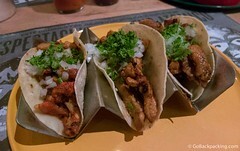 Great variety of 5,000-peso tacos, 4 salsas to choose from, and a big tequila selection. 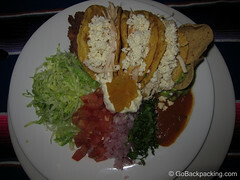 Mexican Envigado Rincon Mexicano $$ This Envigado favorite features typical Mexican cuisine in a festive setting. Outdoor seating is available in front of the restaurant. Mexican Poblado, Laureles and Envigado Milagros $$$ Restaurante Milagros offers diners quality Mexican food in a colorful and playful space, which pays homage to the traditional icons of Mexican culture. Middle Eastern Laureles Fenecia Comida Arabe $$ Fenicia Comida Arabe is a lovely little Lebanese restaurant in the Laureles neighborhood near Medellin’s soccer stadium. The extensive menu offers the standard Arabic fare – hummus, warm pita bread, falafel and shawarma. Molecular Gastronomy Poblado El Cielo * $$$$ Inspired by Ferran Adria, the famed chef behind (the now closed) El Bulli in Spain, Medellin’s own Juan Manuel Barrientos brings cutting edge cuisine to Colombia. Bilingual staff, and an attention to detail make this one of the top dining experiences in Medellin. Peruvian Poblado Peru Mix Fast Food $$ The brainchild of a Lima-born chef named Juan, Peru Mix Fast Food offers typical Peruvian cuisine like aji de gallina, plus more local favorites, like a chicharron sandwich. 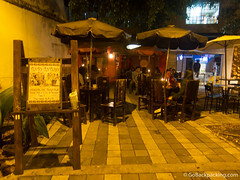 Open late on the weekends to ensure the Parque Lleras crowd can get their late night eats, Peruvian style. Pizza Poblado Romero Cocina Artesenal $$ Located in Poblado, Romero Cocina Artesanal is a trendy Mediterranean-style restaurant specializing in thin crust pizzas. Pizza Poblado Delaire Sky Lounge * $$$ Super chill rooftop lounge and restaurant, perfect for enjoying happy hour drinks and artisanal pizzas. Access is gained through Sixttina Discoteca on the 7th floor of the Rio Sur mall. 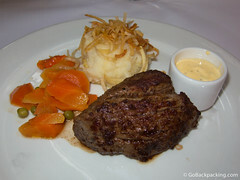 Steakhouse Poblado Ferro $$$ Ferro Restaurant has been serving up high quality, imported beef from Argentina and the United States for the last two years. 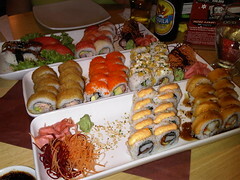 Sushi Laureles Sushi House $$$ Poblado is no longer the only game in town when it comes to sushi restaurants. 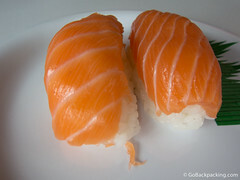 Sushi House offers a wide variety of rolls at competitive prices. Sushi Poblado Sushi Market $$$ Sushi Market is a Poblado-based chain of sushi restaurants with locations further up the mountains, thereby making it less convenient than those around Parque Lleras and the malls of Avenida Poblado. Quality and prices are on par with the others. Sushi Poblado Sushi Train * $$$ Sushi Train, located in the Diez Hotel near Parque Lleras, is the city's only conveyor belt sushi restaurant. Go here if you're looking for a quick bite, or simply the opportunity to sample a wide variety of rolls. 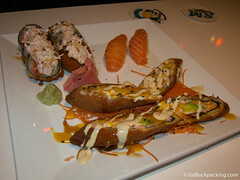 Plus, sit at the counter, and you can custom order from the sushi chefs. Regular seating is also available. Sushi Poblado and Laureles Sushi Light $$$ A popular chain of sushi restaurants known for their 2 for 1 special on sushi rolls every Tuesday. Due to the growth in popularity, it's no longer possible to order nigiri on Tuesdays, but the savings still makes a weekly trip worthwhile. Tapas Poblado Tarambana $$ Spanish-owned restaurant serving authentic tapas and paellas located on the ground floor of the Rio Sur mall. Tapas Poblado Ole Ole Gastrobar Mediterraneo $$ Ole Ole is a Spanish-owned Mediterranean themed gastrobar in Mall Zona Dos. 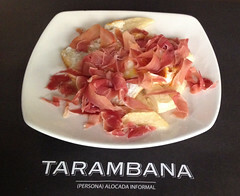 They serve excellent tapas and sangrias, and stock a variety of gins and tonics. Thai Parque Lleras Royal Thai * $$$ The city's only authentic Thai restaurant, Royal Thai was opened in 2009 by a Thai woman. Go here to satisfy your Pad Thai, and spicy food cravings. Vegetarian Parque Lleras Mundo Verde $$ Poblado restaurant dedicated to offering healthy salads, wraps, sandwiches, and drinks. Vegetarian friendly. Vegetarian Poblado Verdeo $$ Located a few blocks from Parque Lleras, vegetarians rejoiced when Verdeo opened its doors, offering diners a break from more meat-oriented Colombian cuisine. 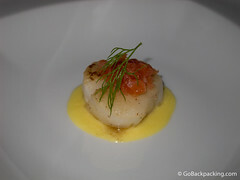 Check out the travel guide for the Colombia episode of No Reservations. If you know an amazing spot not listed here, please leave a comment below with the name and location.